As The Dodgers prepare to open their first road series of the season at Coors Field in Denver against the Colorado Rockies we remember back to 2018 when Colorado shortstop Trevor Story broke Dodger’s right hander Walker Buehler’s rib with a 108 MPH line drive. It was a vicious hit if you remember and it left Buehler with not one but two broken ribs. Buehler is one tough SOB and continued to pitch for several weeks with the cracked ribs. 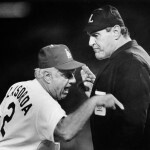 Eventually he had to succumb landing on the disabled list until the injury healed. It was pretty significant at the time for the Dodgers as they had gotten off to a terrible start and Buehler was their best starter during that stretch. With Clayton Kershaw and several other starting pitchers on the shelf, the Dodgers were relying very heavily on Buehler’s powerful young right arm. Of course Buehler came back and was just as good as he ever was. Eventually the Dodgers faced the Rockies in the NL West tiebreaker (game 163) which Buehler got the ball and shut the Rockies down pitching the Dodgers into the postseason. That was the last time these two clubs faced. Buehler is scheduled to start Saturday evening’s game. But did you know that Buehler and Story reunited in the spring to declare their love for Highbrew coffee? I did not know that they were buds, but you can check out the video and hear them talk a little bit about the line drive from last season that connected them. You can check out the press release and read a little bit about Highbrew coffee as well. Drink up boys! High Brew packs two times the amount of caffeine as a regular cup of coffee and is made from the best direct-trade coffee beans all in a convenient, on-the-go can. With flavors including Black and Bold, Double Espresso, Mexican Vanilla, Salted Caramel, Dark Chocolate Mocha, and additional options like Creamy Cappuccino + Protein and new Milk Chocolate + Protein, Triple Shot (for a triple dose of caffeine), and Sparkling, there is an option for just about any “doer” out there. 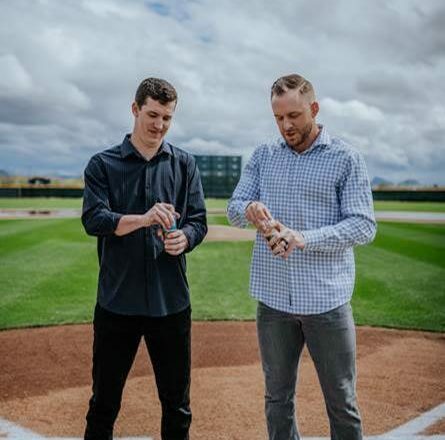 Buehler and Story’s video can be viewed on High Brew Coffee’s YouTube channel and fans can see both professional athletes in various point of sale advertisements wherever High Brew Coffee is sold. For more information on High Brew Coffee®, visit www.highbrewcoffee.com. After working tirelessly for 13 years to turn his tiny tea company into a household name, David Smith, co-founder of Sweet Leaf Tea, embarked on the sailing adventure of a lifetime. Discovering the benefits of refreshing cold-brewed coffee during warm nights navigating rough waters, the idea for High Brew Coffee® was born. Founded in 2014, High Brew is an all-natural 100 percent Arabica blend ready-to-drink cold brew coffee made from Direct Trade coffee beans. Brewed with zero heat, High Brew Coffee® offers premium low-calorie cold-brews in smooth, delicious flavors such as Double Espresso, Mexican Vanilla, Salted Caramel, Dark Chocolate Mocha, Black & Bold and Creamy Cappuccino + Protein. The brand also recently launched three Sparkling Cold Brew Flavors in Classic Black, Vintage Vanilla and Midnight Mocha, as well as Milk Chocolate + Protein, with 3 grams of fiber and 12 grams of protein. Additionally, the brand has a new line Triple Shot, with 3 times the caffeine of a traditional cup of coffee, available in convenience stores. High Brew Coffee is shelf stable to perfectly accompany an active and on-the-go lifestyle. For more information, please visit www.highbrewcoffee.com. I can’t tell what I dislike more. Sounds like interesting stuff. There’s already an abundance of advertising here. I say we should all get a complimentary e-coupon for a free can of the stuff. Must be good. He just devoted about 600 words promoting it. Why can’t you just say what you like or don’t like about what is posted? Weird pseudo-advertorial content or Scott’s silly takes along the lines of : Punting April: The Dodger’s Early Season Strategy. GIve me a break. That is B.S. Say what you mean and mean what you say. Scott is a good guy who takes his time to run this blog and if you have something to say, SAY IT! Otherwise hush. Sorry Package, it’s all you’re going to get. Come on Bluto, have a sense of humor. It’s good for you.